Northern Symphony Festival is the UK’s first ever symphonic metal festival. The event aims to celebrate the UK’s symphonic metal scene and give symphonic metal fans a chance to discover new bands within the genre. One thing is for sure – fans can expect a wide range of symphonic inspired metal on the day! The festival is set to take place on Saturday 4th April 2015 at The Venue in Selby, North Yorkshire. 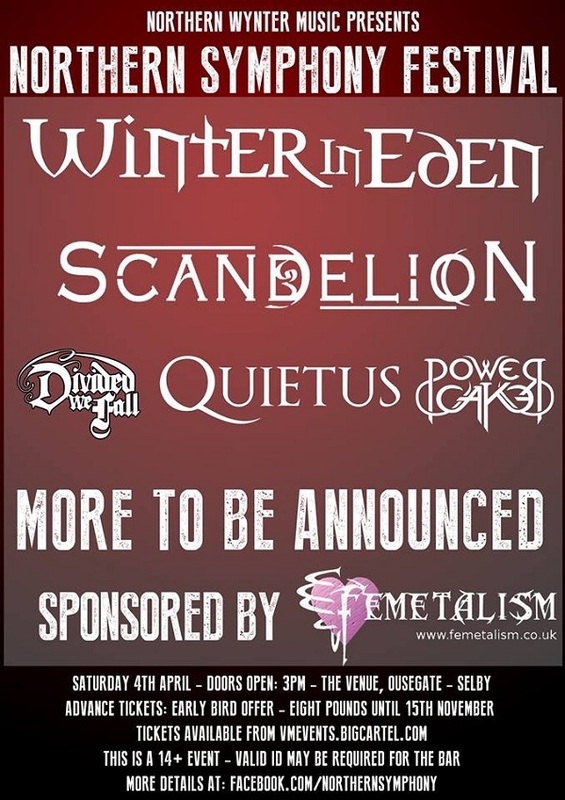 The headline act for the festival, as announced originally by Femetalism.co.uk, is none other than UK symphonic metallers Winter In Eden fronted by Vicky Johnson and with Sam Cull on guitars, Steve Johnson on keys, Ian Heddle on bass and Steve Hauxwell on drums. Winter In Eden’s debut album Awakening was recognised as one of the albums of the year by Sonic Cathedral and Metal Storm. They have also been nominated in Classic Rock Society’s Best New Band (2011/2012), Best Female Vocalist (2011/2012) and Best Live Act categories. Additionally, the track Lies, taken from the album Echoes of Betrayal was awarded Classic Rock Magazine’s track of the day. October 2014 saw the release of their highly anticipated third album Court of Conscience produced by Ruud Jolie (Within Temptation) and mixed by Stefan Helleblad (Within Temptation). The album features guest vocals by the multi award winning Damian Wilson (Threshold, Headspace, Maiden uniteD) and Jermain van der Bogt (For All We Know, Ayreon). Mastering was handled by Sterling Sound (USA) and it is being distributed worldwide by Cherry Red Records (UK). Winter In Eden’s energetic live performances have been enjoyed by capacity crowds in the UK at events such as The Cambridge Rock Festival and various Femme Metal Festivals alongside Delain and Revamp. Most recently Winter In Eden have taken their live show into mainland Europe, performing to increasing numbers in the Netherlands and Belgium, playing with acts such as Stream of Passion and Maiden uniteD. Tickets for Northern Symphony Festival are available for the early bird price of £8 from their webstore. Further details about the festival can be found on its facebook page.